Buying Minutes is Easier Than Ever! Your Q Link phone has been there when you needed it most, or, when you just wanted to call a family member or text your friend “hello.” But, do you sometimes find yourself running low or out of minutes? Even if you already have our 1000 free minute talk and unlimited text plan, you may need extra. You can buy more minutes whenever you need or want instantly on your Q Link Lifeline phone by clicking here. You will save time and money by choosing to purchase your additional minutes at our super low rates. Your phone usage may change. One month you may only use a third of your minutes, and another you may use them all within a couple weeks. If you ever find yourself out of minutes, remember, you can always buy more on www.qlinkwireless.com, 24 hours a day, 7 days a week. 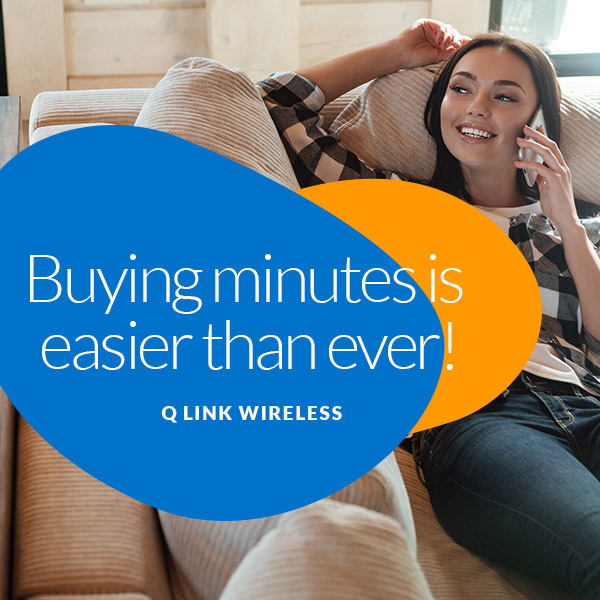 With Q Link Wireless, you can buy all the minutes you need and still enjoy no contracts, no monthly bills and no hidden fees. You can see full details about our refill options here. To buy more minutes, go to www.qlinkwireless.com and click on “Add Minutes” on the main navigation bar or just click here. Then, select how many minutes you would like to buy. To purchase your minutes, all you have to do is enter your Q Link phone number, and then follow the instructions to finish the checkout process. You must use a debit card, credit card, or prepaid gift card to purchase more minutes, and the billing information must match the address we have on file for your account. If you don’t have a debit or credit card, you can purchase a Visa gift card to use for buying your minutes.